A Michigan county health department took down a controversial billboard critics claimed was pro-abortion and released a statement apologizing for its content. 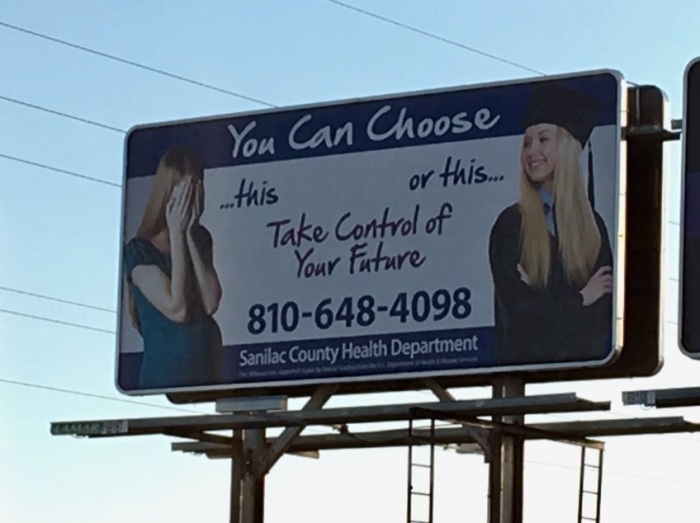 The Sandusky-based Sanilac County Health Department posted a billboard ad last month captioned “You Can Choose” that featured a photo of a distraught pregnant young woman next to a photo of a happy nonpregnant young woman in graduation attire. “Take control of your future,” says the Health Department’s billboard, which includes a phone number for the department. Groups like the Michigan chapter of Right to Life denounced the message of the billboard, posting about it on their Twitter page. “The Sanilac County Health Department put this new billboard up. This is the abortion mindset that pits mother against child. Is this the best we can do to advertise health services?” tweeted the pro-life group. Also outraged, Protect Life Michigan commented on Facebook: "Is it just us, or does it seem like they’re telling women that we have to choose between being mothers or being successful?!" “We now realize, and apologize, that our original intent for the billboard was not correctly portrayed by its content,” stated the department. The Christian Post reached out to the Sanilac County Health Department on Thursday morning. A representative confirmed that the billboard has been taken down. Bryant Wilke, environmental health director at the Sanilac County Health Department, told the Huron Daily Tribune that he was surprised by the backlash. “It came as a bit of a surprise to us that people thought that it was anything but a teenage pregnancy prevention billboard,” explained Wilke to the Tribune. Wilke also told the Tribune that he felt that there “should have been more on the billboard” explaining the context of the images. “Typically, when you look at the statistics, if you get pregnant between the ages of 15 and 19, you drop out of high school. When you look at the billboard, obviously there are no percentages or any types of statistics up there,” continued Wilke. Meanwhile, Protect Life Michigan has posted photos of mothers during their graduation to show "women are capable of some incredible things." "We love how these moms showed the world that to be a mom does not mean we have to give up success, dreams, or a future."